I remember when I was a kid, driving with my mom around town and into the country on Sunday afternoons seeing the sites; the changing of seasons; all the little towns and hamlets that pepper our countryside. Being a lover of old houses she would always point out all the beautiful Victorian homes standing tall here, and nestled in there. It’s always been something that stuck with me, this love for old houses. They become like personalities you bump into and greet everyday. Some are cared for and content. Others are lonely. Some feel mutilated and deformed while others are virtually museums, causing us to step back in time once we cross their threshold and succeeding in reminding us of a different way in what is now a much different world. There is something about living amongst wood that may now age 500 years or more. Much of it cut from the trees that were growing here before the first settlers arrived. The way they seem to absorb the memories, actions and dreams of the generations that were born, lived, and died under their roofs, forever emitting the residual past and enriching the present. Although a little less now due to neglect and bad decision making, Brantford and surrounding area has a rich architectural history. There are times when I blur my eyes a little walking down the street and try to imagine the aesthetics of our oldest neighbourhoods and how they once must have appeared. If you look past all the inappropriate cost saving additions, behind all the vinyl, peeling paint, drop ceilings, replacement windows and wood paneling there is something still there of enormous character and value. Still a lot that could be saved. One example being old wooden windows. There is a whole industry set on convincing us that old Victorian windows need to be replaced with vinyl. Think about it… The windows in my house have been there for 144 years enduring one of the most drastic climates on the planet. Vinyl windows have a 20 year warranty, are incredibly expensive, don’t come in curves and therefore instantly ruin the facade of many homes and public spaces. With the emergence of local innovative businesses like ‘Paradigm Shift Customs -Heritage Building Restoration Specialist’ led by Drew Scuse, local craftsmen who believe in what they do and can add another hundred years to your pre existing windows, why are there so many vinyl windows set on their path of deterioration and general ugliness making? I was raised in a little Victorian Brantford Cottage in the east end with a fairly large carriage house in the backyard that served as my ship of the imagination. Many years later, I now own and am restoring with my wife and kids an almost identical cottage two blocks away from the one I grew up in. Coincidence? Maybe. Yet cathartic all the same. I began to seek out information concerning this prevalent architectural thread stitching itself across the fabric of our city. Inside the February 1864 edition of ‘Canada Farmer’ periodical were printed the floor plans and front elevation for what would become known in our local vernacular as, ‘The Brantford Cottage’. Also reprinted in January 1873 and explained with much enthusiasm, most likely why the form is so prevalent here in our corner of the planet. Although these architectural gems can be found throughout many towns and cities across Southern Ontario and were indeed labelled by Canada Farmer as ‘A Small Gothic Cottage’, Brantford does have a handsome sum of them in many variations built across generations. 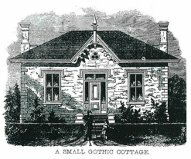 What is a Gothic Brantford Cottage for those who may not know? Most often brick and built with a love for symmetry and classical proportions, the gothic Brantford cottage is generally a square or rectangular 1 or 1 1/2 story three bayed structure. A door in the centre, often with a transom or ‘fan’ window above it, and a window placed to its left and to its right. The roof, being a ‘hip roof’ is one of its most notable and distinguishing features, most likely brought over by Scottish settlers (if a square house had a hip roof, each corner would incline up towards the centre creating a kind of four sided pyramid), broken in the front by a central gable (pointy roof thingy). One author wrote, “The house is so basic in its tectonic qualities that it is intuitively understood, like the stereotypical child’s drawing of a house”. Just take a quick walk through any of the Victorian neighbourhoods in our historic city, East ward, Eagle place, Dufferin, Downtown, etc, and in no time you will be sure to find one, if not many. Yet drive out of Southern Ontario and they quickly fade from the landscape. They are completely unique to our city streets and country roads. Incredibly sturdy, built to last and often possessing large trimmings and decorative bargeboards (gingerbread), the style made it possible for working class families and tradesmen to afford sanitary living conditions in a time when log cabins dominated our landscape (in its simplest form, four rooms to the front divided by a central hallway with the kitchen separate from the living quarters at the back), all the while maintaining a Victorian charm with its spacious rooms and high ceilings, thought to aid in elevating the spiritual lives of the emerging middle class (no lower than 10 feet the Almanac suggests). They are almost always deceivingly large and refreshingly rational in their layout. As I said, we have been restoring our little cottage coming on two years now. Removing drop ceilings and strata of flooring to reveal the original plank. Fixing holes in old plaster you could crawl through. Its not the same cramped house we moved into anymore. A local eccentric told us the place was haunted and no one ever stays. I think the ghosts must like us. Or maybe the house was aggravated and simply felt ugly and unloved. It’s as simple as a house gets with very little excess. We don’t fix it and try to return it to its proper proportions because we think it will make a lovely heritage designation, or has some unique value that will make the annals of Brantfordia. It’s one of many across the city. But it’s ours to love like a member of our family and we do it because no amount of modern renovation could surpass the beauty and character of what is already there tucked behind a veil of good intentions. We do it because the space we live in affects our lives, and the bettering of it can almost be likened unto a spiritual practice that in turn improves our city and our outlook of its future, simply by tending its past. More times than nought, a little paint and plaster, a keen eye and a lot of elbow grease will create a far more beautiful outcome than something new made from inferior materials. I believe Brantford is coming into really recognizing the value in its historicity. A kind of grass roots renaissance that’s going to pick up the pieces of its broken and neglected past, and rather than replacing them with cheap temporary plastic solutions, sit down and like the craftsman who built our city, take the time to fix and restore them.